Der folgende Bericht über die Restaurierung von Ghirlandaios Sassetti-Kapelle ist auch auf Deutsch erhältlich (Langfassung mitca 1600 Wörtern). Bitte schreiben Sie an joachim-stark@t-online.de. When the Florentine banker Francesco Sassetti in 1470s decided to buy the right for the decoration of a chapel in the Vallambrosan church of Sta. 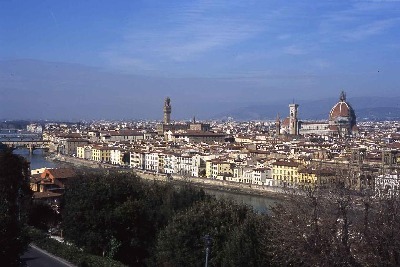 Trinità in Florence, in his view this was only the second best solution. He would have preferred a much more prestigious location, the cappella maggiore (chancel) in Sta. Maria Novella, where his family possessed long-standing claims. But Francesco Sassetti, who belonged to the Medici entourage, had to yield to another banker from the Medici circle, who was even more wealthy and influential: Giovanni Tornabuoni. At least the decoration of the chapel in Sta. Trinità should document his elaborate taste and learning, and his knowledge about quality in the visual arts. And he commissioned Domenico Ghirlandaio to decorate this chapel with frescoes showing scenes from Francesco’s name-saint St. Francis of Assisi and to paint an altar panel representing an “Adoration of the Shepherds”. Ghirlandaio, also a portrait specialist who was able to integrate harmoniously numerous portraits of members of the Sassetti family into the religious subject-matter, would not disappoint the expectations of his patron. His work represents one of the most impressive chapel decorations in the second half of the 15th century. It was completed in December 1485, as shows the inscription below the donor portraits of Sassetti and his wife Nera Corsi Sassetti. In the following year, however, the Ghirlandaio workshop started the decoration of the family chapel of Sassetti’s rival, Giovanni Tornabuoni, in the chancel of Sta. Maria Novella, a task, which was even more demanding but also more prestigious. In 2004 and 2005, for about 12 months, the Sassetti chapel was closed for visitors. A huge scaffolding, reaching six meters up into the vault, barred the view from the frescoes depicting scenes from the life of St. Francis, like “St. Francis renouncing the worldly goods” and “St. Francis receiving the stigmata”. Only the donor portraits of Francesco and Nera Corsi Sassetti in the lowest register of the front wall, were still visible. Ghirlandaio’s large altar panel, an “Adoration of the Shepherds” (tempera and oil on panel, 167 x 167 cm) including its renaissance frame had been transferred to the adjacent chapel to the left. Because of the poor illumination in this location, it was rather difficult to study this important panel in detail, in which Ghirlandaio is influenced by the famous Portinari altarpiece by Hugo van der Goes (1483, now in the Uffizi). 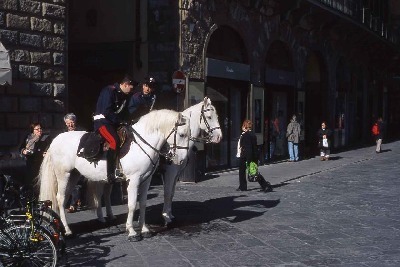 The reason for all these measures: In April 2004 the Soprintendenza per il patrimonio storico artistico at Florence had started restoration works which had become necessary because of rain water which had infiltrated through leaks in the church roof. The humidity, mainly on the left side of the vault close to the corner to the front wall, menaced to loosen the intonaco – the uppermost layer of plaster carrying the pigments of the frescoes. In addition, since the last restoration (1967/68) following the Arno flood disaster of 1966, dust and other deposits on all the frescoes had weakened their luminous power. The restoration is now terminated. Only the reliefs of the arches of the niches sheltering the sarcophagi of the Sassetti couple need to be cleaned. By mid-May 2005 the scaffolding was removed. In any case, during the summer season 2005 the chapel is accessible again to visitors, confirms Maria Matilda Simari, from the Soprintendenza per il patrimonio storico artistico of Florenz and head of the restoration campaign. 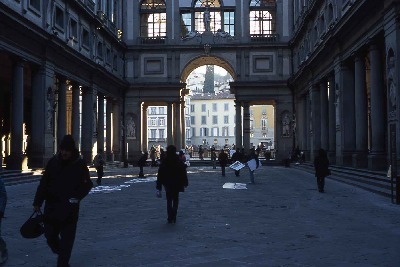 A unique work of art may again be looked at, whose origin is closely connected with the rivalry between two Florentine families, who owed their wealth to their successful work for the Medici bank. While Sassetti was mainly in charge of the Medici business in Geneva and Florence, Tornabuoni was active as a Medici representative in Rome, where one of the principal Medici clients, the pope, ruled. The artist Domenico Bigordi, who called himself after his father’s profession “Ghirlandaio” or “Grillandai”, i.e. garland or headdress maker) managed to get along with both Medici-protégés. His determination, his diligence and his know-how as an efficient workshop organizer, but also his adaptability to the needs of his patrons may have helped. His participation in the decoration of the Sistine chapel in Rome (together with Perugino, Botticelli, Cosimo Rosselli and Luca Signorelli) established him as one of the leading Florentine artists of his time, meriting the most prestigious commissions, among them in the 70s and 80s of the Quattrocento the decoration of the Sassetti chapel in Sta. Trinità and the cappella maggiore in Sta. 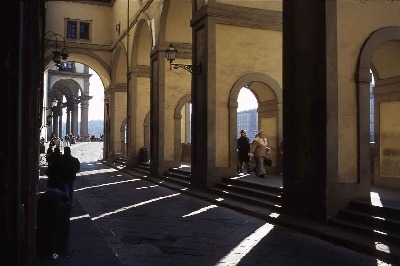 Maria Novella. Ghirlandaio managed to satisfy both, Sassetti and Tornabuoni. In the beginning, the intention of Sassetti must have been to claim the old rights of his family to the chancel of Sta. Maria Novella as burial chapel, how weakly founded these claims may have been juridically. However, the Dominicans decided against Sassetti and in favour of Tornabuoni. One of the reasons was perhaps the subject-matter of the decoration in the case of Sassetti: a fresco cycle depicting the life of St. Francis in the chancel of a Dominican convent must have been inappropriate. In the final analysis perhaps the financial power of the two competitors was the decisive factor. While Sassetti’s assets were in decline due to an unfavourable development of the Medici business north of the alps, Tornabuoni’s fortune seemed to guarantee a successful termination of the enormous project of the cappella maggiore decoration, which also included a polyptych for the high altar (the main panels are now in the Alte Pinakothek, Munich, and the Gemäldegalerie, Berlin). Tornabuoni was accorded the right to decorate the chapel and subsequently to use it as a burial site for himself and his family. That the monks had backed the right horse turned out in 1495, when after nine years of intense work the Ghirlandaio workshop terminated the project with the delivery of the altar polyptych. During the final year the workshop had to get along without Domenico. In January 1494 he had died unexpectedly, in the age of 46. After having been unsuccessful at Sta. Maria Novella, Sassetti had to look for other options for his burial chapel. He finally came to terms with the Vallambrosans of Sta. Trinità, who had a special veneration also for St. Francis. Probably in 1479 Ghirlandaio received the commission for the chapel decoration. The work on the frescoes must have effectively started in 1482 after Ghirlandaio’s return from Rome. The chapel decoration mainly consists in six frescos depicting scene from the life of St. Francis. For some of the scenes Ghirlandaio must have used the cycle of St Francis painted by Giotto in the chapel of the Bardi family in the Franciscan convent of St. Croce, for instance in “St. Francis before the Sultan”, the “Stigmatization” and the “Funeral of St. Francis”. But he also added new and ingenious inventions, above all in the scenes on the front wall above the altar, which are certainly the most important scenes, as they are visible to everybody who passes by. Here Ghirlandaio painted a scene which is rarely represented in St. Francis cycles, “The resurrection of the notary’s son”, a miracle St. Francis worked posthumously in Rome, where a young boy had died after falling off a window. The reason for the integration of this subject-matter may be seen in the death of Sassetti’s son in 1479. In the same year his wife gave birth to another son. This was perhaps interpreted as a resurrection and as sign of God. Ghirlandaio situates the resurrection scene not in a Roman setting, but in Florence, directly in front of Sta. Trinità. 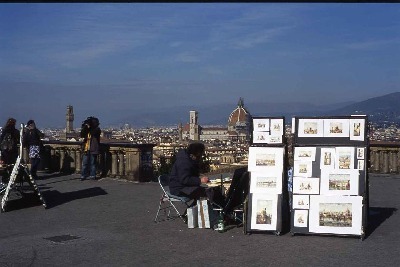 In the background he puts into perspective the Arno bridge. That the miracle is happening in Florence may be an allusion to idea that Florence, as the new home of Republican virtues, is on a par with or even superior to Rome. However, the scene also alludes to the resurrection of the Sassetti couple on the Day of the Last Judgement and it presents the occasion to portray several contemporaries of Sassetti as witnesses to the miracle. To the right we find a bystander portrait of Ghirlandaio himself: as an established artist among other influential citizens of Florence, his left arm akimbo and looking self-consciously at the viewer outside the picture space. Ghirlandaio has inserted a similar self-portrait in the fresco showing the “Expulsion of Joachim from the temple”, which is part of the cycle about the life of the Virgin painted for Giovanni Tornabuoni in the cappella maggiore in Sta. Maria Novella. Above the “Resurrection of the notary’s son” Sassetti and Ghirlandaio have placed the “Confirmation of the Franciscan Rule by Pope Honorius III”. This happened in Rome in 1223. 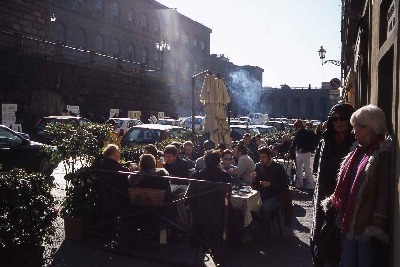 But the artist again makes this event happen in Florence: In the middle of the background is represented the Loggia dei Lanzi, to the left the Palazzo Vecchio (still equipped with the ringhiera, a kind of platform along the façade, which was later removed).To the right of the scene, close to Pope Honorius, is shown Francesco Sassetti, to his left is depicted his protector and patron, Lorenzo de’ Medici (“il Magnifico”). 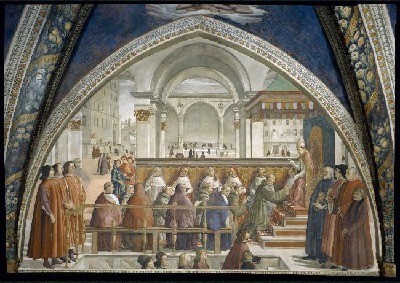 By using a compositional artifice, which may only be called ingenious and innovative, Ghirlandaio succeeds to integrate additional portraits into the picture: In the foreground figures are climbing over a staircase from a lower floor to the level where the confirmation of the rule is taking place. The group, consisting of the sons of Lorenzo de’ Medici, is led by Agnolo Poliziano, the Humanist and teacher of the Medici sons. With the aid of this representation Sassetti is substantiating his close connections with the Medici, but also his ideals as a humanist, who practiced the Latin language and who collected antique coins. Sassetti did not succeed to acquire a family chapel in one of the most prestigious churches in Florence, i.e. Sta Maria Novella. But without doubt he has succeeded, by using the genius of an artist, to erect a monument to himself, his family, his social stratum, and the intellectual ideals of his time, a monument which has survived now for more than 500 years. At the same time, Sassetti has presented the opportunity to Ghirlandaio to create a masterpiece. Thanks to the recent restoration, accompanied by the installation of a new lighting system, the qualities of this masterpiece may again be studied in detail. 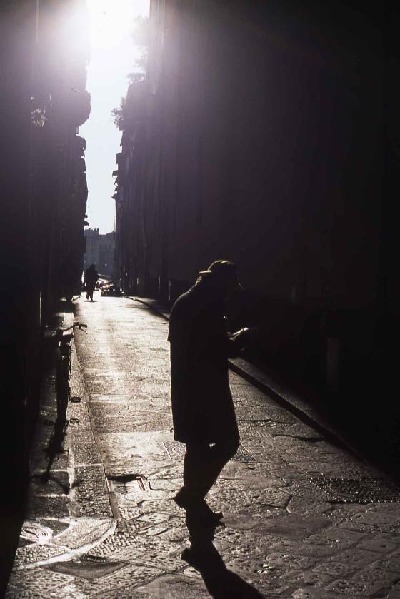 However, if Francesco Sassetti could today once again return to his hometown, he would probably be disappointed that the shadow of his powerful rival is reaching almost to the door of his burial chapel. The street leading to Sta. Trinità is named after the family who prevailed in the competition for the cappella maggiore of Sta. Maria Novella: It is the Via dei Tornabuoni.